Now, what is it in Rio what brings all the tourists and make them wanna stay? All I knew before I came here was Copacabana beach and The Christ statue on the top of the Corcovado Mountain, but there’s so much more than that. The historical center, the hip neighborhood of Santa Teresa, the fancy Ipanema, all the hiking around and all the beaches to relax and learn surfing. Many places and tours are expensive and crowded, but there’s is also loads of free things to do in Rio de Janeiro, and that’s what we mostly did. Check the best party hostels in Rio de Janeiro here. The first day our intention was to rent a bike and explore the beaches with it. There is a system of city bikes (Bike Itau) which works with a mobile app and online payment of only 15$R/month or 8$R/day. Unfortunately, this app didn’t accept our European cards and we had to go for the more expensive option of renting a bike in our hostel. We also used Uber and city metro, both widely accessible and affordable. The metro system is quite easy to navigate and took us to all main points in the better neighborhoods and is also much cheaper than Uber. Based on many online articles, the best neighborhoods are Lapa, Flamengo, Ipanema, and Copacabana. Lately, Santa Teresa is also becoming popular, but is a bit more distant from the center and beaches and is not connected by the metro network. We chose to stay in a beach hostel in Ipanema and I think it was a very good choice. We were located exactly in the middle between the beach and the Lagoa Rodrigo de Freaitas. Close to many good restaurants, fast foods, and bars. Read about the best party hostels in Rio de Janeiro. Our plan for the first day was to explore the Copacabana and Ipanema beaches by bike. This plan though crashed at the same time as one of our bikes, just at the end of Ipanema beach and we had to push it back to the hostel. Rest of the day we spend on foot discovering the area of Ipanema neighborhood, walking around Lagoa Rodrigo de Freaitas and visiting Parque Lago with its amazing greenery and hidden corners. The second day we took an Uber to the center and walked down its street. We’ve planned a visit to the new Museum of Tomorrow as rain was forecasted, but it was sunny the whole day, and I didn’t want to spend such beautiful day in a museum, so we just admired its modern architecture from outside and headed towards the historical center and Escadrila Selaron stairs from a Chillean artist Jorge Selaron, who started renovating stairs in front of his building in 1990. We ended the day by almost watching the sunset from the top of the Sugar Loaf Mountain. Looking for more destinations in Brazil? Check this article with best places to visit in Brazil. The third day we were finally brave enough to jump on the metro train and took a ride to the bus station for the tour to the Christ the Redeemer. The only reason I wanted to go there was to take a picture of the view, but it was quite foggy that day and the idea of all the tourist up there and the high price of the visit turned me off and instead we rather went to explore more of the city, absorbing the atmosphere and eventually doing some shopping as well (jeej, all my pretty new clothes). The day ended with the most amazing sunset view from Pedra do Arpoador at the northern corner of Ipanema beach. *All the prices I stated are for 2 people, without the cost of the hostel (129R$/night). 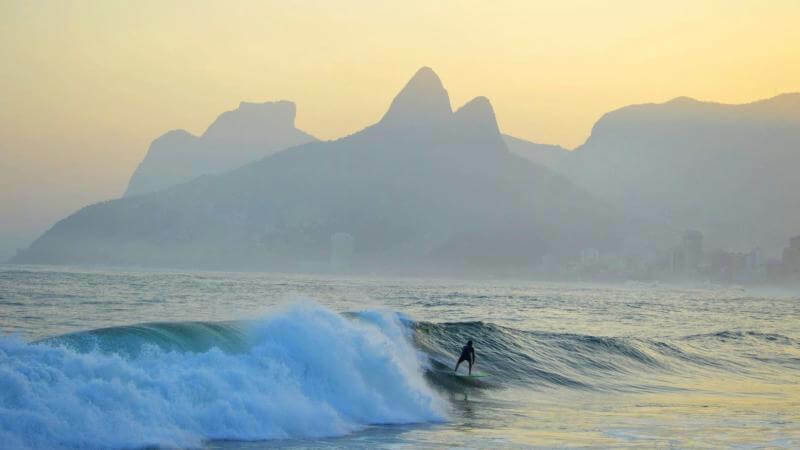 Have you already visited Rio or are you planning your visit now? Would love to hear about your experience in comments.